Part sociological experiment and part adventure comedy, Vegucated, follows three meat- and cheese-loving New Yorkers who agree to adopt a vegan diet for six weeks. Lured by tales of weight lost and health regained, they begin to uncover the hidden sides of animal agriculture that make them wonder whether solutions offered in films like Food, Inc. go far enough. This entertaining documentary showcases the rapid and at times comedic evolution of three people who discover they can change the world one bite at a time. 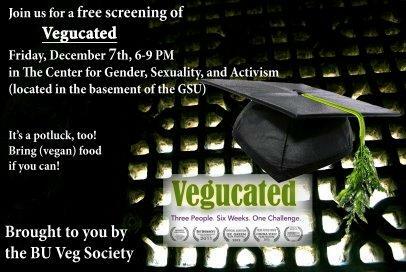 *FREE* Screening: Friday, December 7, 2012, 6pm-9pm at Boston University’s George Sherman Union, Basement Floor – CGSA (Center for Gender, Sexuality, & Activism), 775 Commonwealth Ave., Boston, MA.